Choux dough is considered the most simple in manufacture, provided that exactly meets all of the ratio. Because it makes a lot of different pastries, from éclairs to profiteroles. 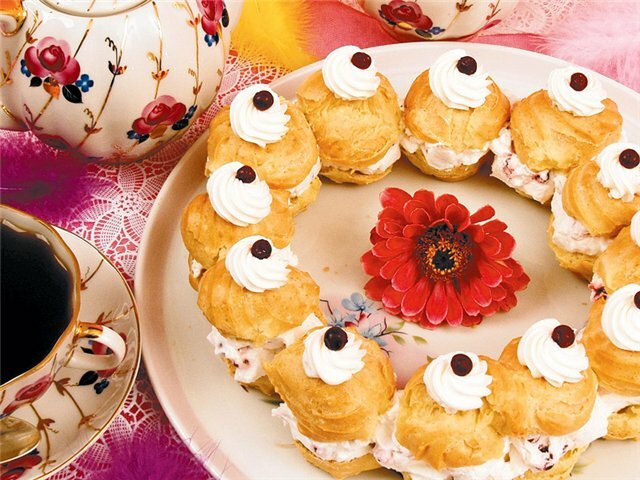 One of the main rules that should be followed in the manufacture of choux pastry to stick to the recipe. • 2/3 Cup water or milk. Pour into a saucepan the milk or water, add salt and oil, mix. Leave to boil. To boiling mixture gradually pour the sifted and measured flour. Reduce heat and briskly stir the mixture with a spatula, preferably wooden, until the disappearance of the flour lumps, and then simmer for 1-2 minutes. Brewed remove the mixture from the heat, cool it to 70-80°C and stir, one by one add the eggs. With all that mass need not beat, just stir until a homogeneous dough in the absence of lumps. If the eggs are large, they need to take one thing less than the posted recipe. Prepared dough is put in the equipment bag or paper kornetik with a metal nozzle with a diameter of 11-16 mm. Prepared choux dough should be like sticky mass. Put on a greased baking tray portions, forming various figures. The trays need to lubricate quite a thin layer of oil. On a heavily greased baking pan, the bottom product obtained torn. If the pan is completely dry, the products burn and stick if that happened, then carefully cut them with a knife. Bake custard products 30-35 min in the oven at a temperature of 185-200°C. At the highest temperature possible products of a larger size with a ragged surface, at low temperature — with a bad rise. Normal dough, subsequently laid out on a baking sheet, a bit of a blur, but during baking it will rise strongly, as inside the products from choux pastry formed cavity. You should not use the ingredients on the eyes, you should not add the flour until the water boils, and don't need to add all the eggs at once! Not yet formed a crust on the cakes, the oven can not be opened, otherwise the product can "fall off".